Finally! A break out performance. TOBY'S CORNER, knocked off the "also rans", including UNCLE MO, to win the Wood Memorial. ARTHUR'S TALE, was second best, to put his name in the Derby mix as well. After pulling up behind a wall of horses coming out of the turn, Toby's Corner, wearing blinkers for the first time, was clearly focused on picking off the rest of the field. 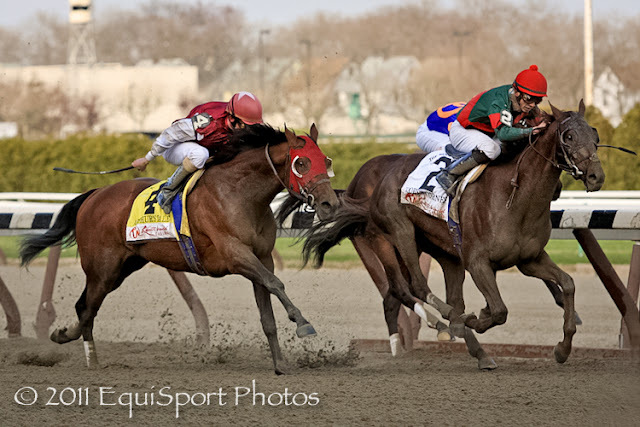 He moved to the outside collaring Uncle Mo on the rail, and only Arthur's Tale was left. Jockey Eddie Castro had that rival measured with a neck to spare at the wire. 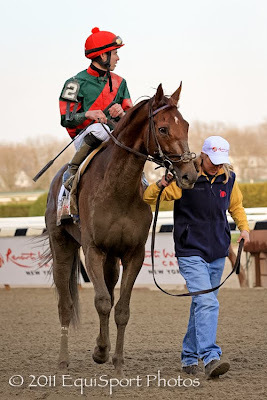 After a disappointing 3rd in the Gotham, trainer Graham Motion had been thinking about the Preakness for Toby's Corner. The thinking now appears to be Churchill Downs. “We’re going, as long as he’s doing fine,” Motion said. “It looks like the mile and a quarter won’t be a problem, and it’s very wide open now. It’s obviously a very-wide-open group, and I kind of think he ranks right up there with the top ones." TOBY'S CORNER does not seem to have a problem with getting the classic distance. I'm going to move him up to "Turf & Dirt" #2. And although ARTHUR'S TALE is on the Earnings Bubble, I'll put him in as "T&D" #14. In yet another example of horses backing up, UNCLE MO staggered home for a disappointing, but hardly unexpected, third place finish. The trendy training formula is for two preps as a three year old on the Derby Trail. It's not working. Track announcer Tom Durkin compared Uncle Mo's defeat in the Wood similar to the great Secretariat's loss. What should be remembered is that Secretariat was making his 12th start in the Wood. Perhaps if Uncle Mo had even half that number of total starts, he would have had an excuse to wobble down the stretch. I'll leave UNCLE MO in the top 5 at "T&D" #4. For now. In another nice race, MIDNIGHT INTERLUDE, despite a chop block in the stretch from COMMA TO THE TOP, proved much the best in the Santa Anita Derby. Trainer Bob Baffert now has a possible 3 entries in the Kentucky Derby with Midnight Interlude's impressive win. Stablemate THE FACTOR seems like a lock for the starting gate, and JAYCITO has a chance with a good showing in the Lexington Stakes. 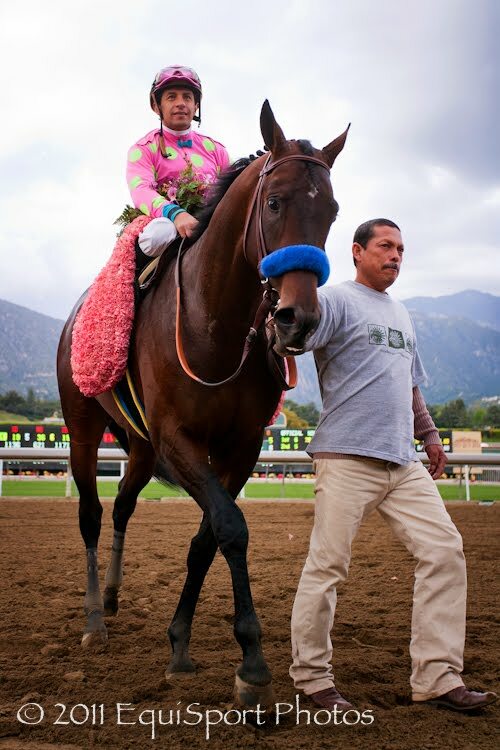 Baffert's was forced to scratch Jaycito the day before the race with a sore foot problem. That left longshot 14-1 Midnight Interlude to carry the stable. The War Chant colt ended up the determined victor. "I'm elated," Baffert said afterwards, "and somewhat surprised he won. I didn't know what to expect. But he raced like he had been training. The biggest wins are when you are hoping but not really expecting it." Midnight Interlude would be the first Derby starter for owner Arnold Zetcher. "We still have a ways to go so you never think too far ahead. Things can happen to these horses, so you don't try to get too excited about it. 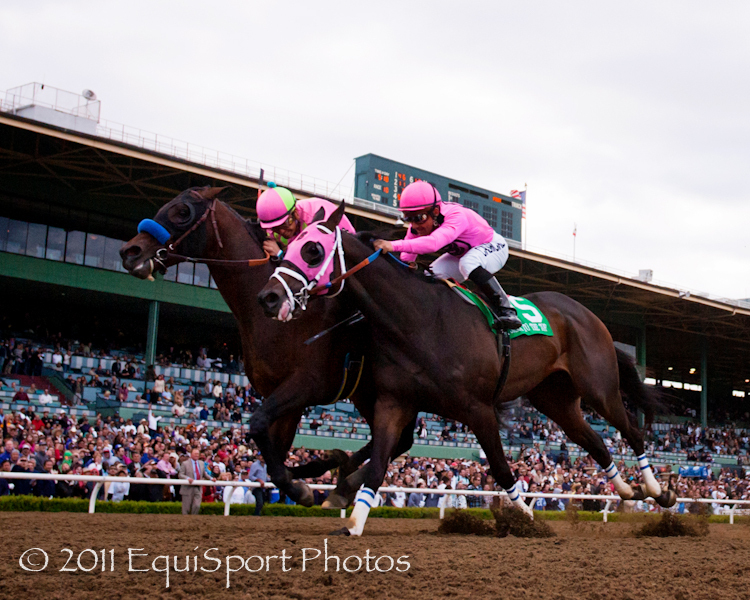 But the Zetchers tonight, they can get excited about it," Baffert said. MIDNIGHT INTERLUDE drops in as "Turf & Dirt" #2. COMMA TO THE TOP is again back in the Derby discussion, he has the "T&D" #17.